This 3” Square, Solid Acrylic Cube is clear with a black screened base. It creates an optical illusion of looking solid black at some angles and clear at others. 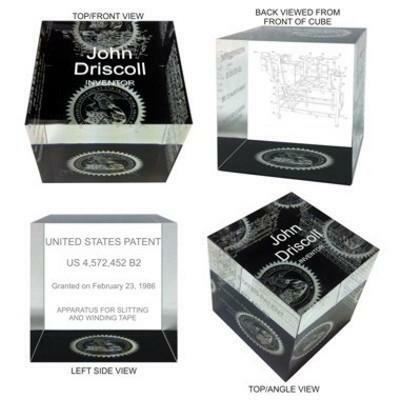 Basic design is Inventor Name laser engraved on the top, Drawing on the back, Patent Number and Date on the left side, Abstract on right and USPTO Seal lasered into the base.